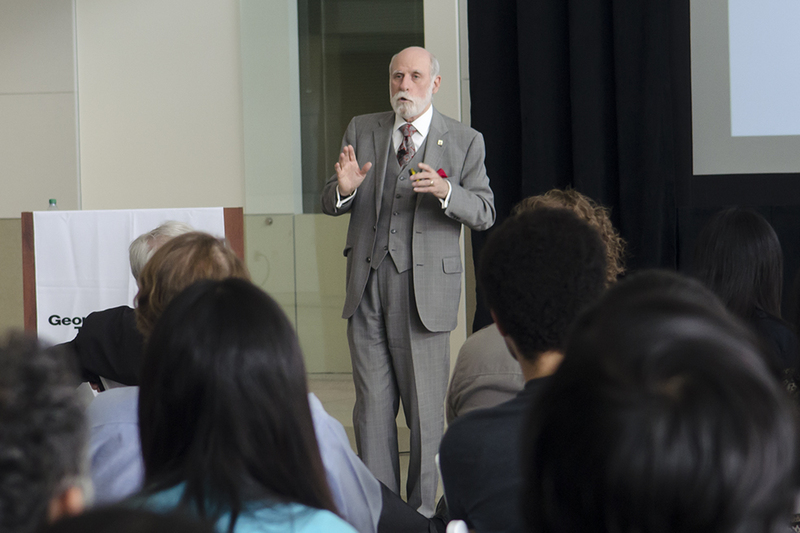 Donning a slick three-piece suit and possessing an astute mind, Vint Cerf, the Vice President and Chief Internet Evangelist at Google, recently spoke to an eager group of Tech students and faculty as part of the Marconi Society Paul Baran Young Scholars Symposium. Rightly held in the Klaus Atrium, the event also sought to celebrate the twenty-fifth anniversary of the esteemed College of Computing. With a detailed presentation titled “Dynamics, Evolution and Explosion of the Internet (to Billions of Devices),” the Turing Award winner and Internet co-creator discussed the emergence of the Internet along with the proceeding advancement of technology. With regards to technological innovation, he discussed the invention of mobile handheld phones in the 1970s and 1980s. Cerf referred to the current confluence of the Internet and the advent of mobile technology as a singular platform titled the “Internet of Things.” Although vague in theory, the “Internet of Things” greatly influences individuals’ daily lives. According to Cerf, the Internet’s architecture is vastly flexible, which allows innovators and inventors today to tinker around and create new ways for technology to become a seamless part of human life. He cited the invention of Google Glass, an optical head-mounted technology, as a classic example. He then went on to warn the audience about the numerous challenges and precarious nature of what he deemed “the Internet Ecosystem.” In particular, he discussed the challenges associated with the governance of the Web, Internet privacy, hardware-reinforced security and the elimination of bugs in all software. He also discussed how net neutrality continues to remain a hot topic as major controversy surrounds the issue. Cerf foresees one crucial technological disruption that will cause problems in the near future: the preservation of digital content. Moreover, Cerf is worried that the twenty-first century faces the increasingly insurmountable challenge of trying to retain all the digital content produced. This is the case primarily because many of the programs and hardware that are used today will be outdated and, therefore, defunct in the future. Using descriptive imagery, he then drew up a powerful scenario in which he asked the audience to imagine they were in the twenty-second century and were unable to open up a 1997 Microsoft Word document on the new Windows 3000. “We’re entering a digital Dark Age where future generations will not find any of the millions of media, photos, documents we store today, not because the bits are unreadable, but because they cannot be interpreted,” Cerf said. To find a solution to this perilous dilemma, Cerf believes — first and foremost — that certain issues regarding property rights, legal framework and big data capacity need to be addressed. Although the “explosion of the Internet” brought about a new quality of life, the invention also brought about problems that must solved or, at the very least, acknowledged. Cerf hopes the international community responds to this issue soon.